Welcome to the twelfth newsletter, which is our way of keeping all of you informed of the progress we are making on the road toward distribution and recognition of the documentary film. It’s been only a little more than two months since our last newsletter, but so much has happened that I felt the need to share the latest with all of you, so I decided to send this issue out now. So here we go! Good News - I just recently hired a public relations person and she and I immediately connected in a very good way. Paula Mitchell (Mitchell Communications) is local and she already created a press release about the documentary and the song, and has begun to send it out to radio stations, magazines and newspapers in our region. She also created a very good five-minute video for a Facebook page called Hudson Valley Heroes. I am delighted with the clip and quite humbled by the idea that I might be seen as a hero. The link is below. Please check it out and forward it to everybody who you think may be supportive. 1. Sunday, November 11, at 7 p.m. at the VFW in Kingston, NY. This showing is especially for veterans of Kingston and vicinity and their families who have been so supportive to the project from day one. However, it is also free to the public. I will be on the radio in Kingston, New York, on WKNY-AM (1490) on Saturday, November 3, at 10 a.m. to talk about the project. Shayne Gallo, the host of the show, has been very supportive to me, and so has the owner of the radio station. Please contact me if you know of any other venues, TV or radio stations, or publications that may help us get the movie more visibility. I am committed to doing my best to reach as many audiences as possible. That’s currently the most important way we have to help this movement go forward. I have also been invited to speak at the Kingston City Hall on Sunday, November 11 to honor veterans on Veteran’s Day. It’s a privilege, and I will do my best to share inspiring words about how Veteran’s Day really matters. In addition, we have tentative plans to show the film in a few more places, and good possibilities for me to be interviewed about the project in magazines and on the radio. At this moment, things look very good! Challenges - A couple of months ago I was very excited about hiring Ein Sof Communications, a disability advocacy company, to help us move this important project forward. Although the screening of the documentary in Washington, DC on June 13th, arranged by Ein Sof, was quite useful, unfortunately though, we soon after agreed to part ways. The disappointment for me was equal to the enthusiasm from the initial optimism I felt when we first decided to work together. However, as life often would have it, when the optimistic bubble burst I began to work even harder than before to move this project forward. The film festival rejections are still incredibly perplexing. I have no idea why the documentary has not been chosen by any film festival, but at this time I am focusing away from that path, and toward finding friendly venues to show the film. We may look to future screenings at high schools, college campuses and military venues. Do you have any creative ideas about where to offer the documentary? We are open to all ideas. For some unknown reason, Facebook refused to allow the Hudson Valley Heroes Facebook page to boost the wonderful five-minute video recently created by them. Many other boosted clips on their Facebook page have received between ten and twenty thousand hits. Our clip, up to this point, has yet to be seen by one thousand viewers. Very frustrating. We are still seeking donations so we can continue to use funds to persist with our outreach, focusing on promotion and distribution of the film. Please check out the latest on our web site, whycantweserve.com, as we keep updating it. Thanks to all of you for caring about this project. Your continued interest and support have been, and still are, fuel for all of us as we eagerly look toward tomorrow with “The Movie-Turned-Movement.” And please take a minute or five to think about veterans on Veteran’s Day, November 11th! Welcome to the 11th newsletter, which is our way of keeping all of you informed of the progress we are making toward recognition and distribution of the documentary film. I finally found a well respected company that I’ve contracted with who will hopefully help me promote and distribute the documentary. Their name is EIN SOF Communications and they have been at the forefront in helping to empower all people with disabilities. Check them out if you like. You can find them at einsofcommunications.com. I like their motto which is, "Diversity is a business imperative…Inclusion is a choice." Tari Hartman Squire, the executive director, has been supporting people with disabilities for years and appears to be very connected with disability liberation groups that matter. She helped organize a screening of the documentary in Washington, D.C., in June, and is currently working on compiling lots of wonderful information from the event. I flew in to D.C. for the day and was delighted with the screening and the amazing discussion that ensued. We had a good turnout of folks from Blind Veterans of America, Easter Seals, the Christopher Reed Foundation, and a number of veteran services groups including the Paralyzed Veterans of America, who hosted the event. The discussion after the movie was lively and filled with important information, as well as some good ideas for the future of the film. I was touched when three veterans told the group that they would have stayed in the military after becoming disabled, if they could have, but that opportunity was not offered to them. It was a painful revelation of exactly why we made the movie. Just recently we received the completed version of the documentary with descriptive video as well as open caption. Now we have a version that can be fully enjoyed by the deaf and hard of hearing as well as blind and visually impaired people. I am pleased about this, although it was a costly expense. Now we are seeking venues where those groups could get a chance to view the film. Please contact me if you have any ideas about groups or organizations that may be interested. Our GoFundMe campaign of a few months ago did not reach our goal, and now we have very little funds to move forward with. But we have a professionally made film and a trust in the higher powers that inspired this movie in the first place. A minister friend of mine told me that, “when spirit guides, spirit provides.” I am doing my best to relax into that point of view. I am still hoping to get the documentary into a few film festivals and I should learn soon about two submissions for festivals in October (fingers crossed). The next steps with EIN SOF Communications are not clear at this writing, but we expect good things will arise in time. Politics seems to be front and center these days and probably will be the major focus until the November elections. In closing, I want you all to know that my song, "A Veteran’s Anthem,” is now available on iTunes and can be heard on Spodify. How cool is that? I hope that the song will help all people to focus on what’s great about being alive. But I also think it may bring more visibility to the documentary. Only time will tell, but I am excited about it. If you are interested in a copy of the song, you should be able to purchase it on iTunes. You can also purchase it from CD Baby. It’s completely possible that our documentary film, and our continuing efforts, may be a catalyst to help reduce veteran suicides, and, at the same time, help to improve the lives of all people with disabilities. Let’s see what the future has in store for the Why Can’t We Serve documentary. Thanks again for all your support, as our community of donors and friends continues to grow. And your interest in, and desire to help us with the movement, really makes a big difference! Welcome to the tenth newsletter, which is our way of keeping all of you informed of the progress we are making, now on the road toward recognition and distribution for the documentary film. We have just begun a GoFundMe fundraising campaign with two major goals. We are seeking to raise at least $5,000 to help cover the cost of closed-caption and descriptive video, so that all people with disabilities will be able to fully experience the movie. Any additional funds that come in will be used to promote the documentary as well as work toward securing more distribution for the film. We’re very excited about this fundraising campaign because we now have a brand new, dynamic, three-minute trailer to intrigue any new viewers. And, in addition, we are offering, for free, a link to the complete 54-minute documentary. Here’s our reasoning. We want this campaign to be far reaching, and to make it possible for everybody in the country to have the opportunity to see the movie. Our goal remains to help reduce the number of veteran suicides taking place every day, and we think this campaign may greatly enhance the recognition and distribution we are seeking for the documentary. We may be sacrificing an opportunity to sell the film, which is a more normal path. However we are taking what we believe is the higher road, and we trust that we will still raise the needed funds to aid us in our efforts. The full 54-minute documentary film will only be available until June 10. So stop everything you are doing, and click on the link to our GoFundMe page and enjoy the new trailer, as well as the completed 54-minute movie. And please help us get the film widely circulated by sharing the GoFundMe page with friends and family. I have been in contact with the director of Veteran Services at a Florida university, who promised to forward the movie’s link to those who make big decisions for veterans around the country. I am hoping that, once viewed, those in charge at Veteran Services will see the value of the film, and encourage all colleges and universities with Veteran Services to offer the documentary to all vets at their schools. We have attempted to contact Paul Rieckhoff, the executive director of the Iraq Afghanistan Veterans of America (IAVA) a number of times, but have not heard back from him or any staff member yet. I strongly believe that the IAVA organization would benefit greatly by embracing the documentary and making it available to their membership. We also took some advice and wrote to filmmaker Michael Moore, to see if he could offer us any suggestions for promoting the film. We continue to seek a nationally connected company that is focused on disability liberation, that would be excited about collaborating with us. The documentary is so beautifully inspiring toward those with disabilities who choose to focus on their incredible diverse abilities, as well as their love of life. It appears to be a golden opportunity waiting for the perfect match. We now have applied to twelve film festivals, and are looking forward to showing the documentary at some of them. I understand that the Why Can’t We Serve doc may be quite controversial, especially to the military, and parts of the film are painful to watch, but it is a meaningful and important story focusing on an ongoing tragedy that is not going away. I expect to be accepted to a few film festivals, but it hasn’t happened yet. Check our website regularly for the latest film festival information, since we could be accepted to a number of festivals any day. I’d appreciate it immensely if you have any creative ideas to help us fulfill the above challenges. You can reach me via the Contact Us page or by phone at (845) 679-7532. Only time will tell to see how effective our GoFundMe strategy will turn out to be. But I am hopeful. Once again, please share the page with friends. That’s one way your proactive efforts can really make a big difference. If you have any friends who are involved with TV, radio, magazines, or newspapers, we could also use your help in this area. We’re just starting to search for interview opportunities for me and for the documentary film. Any visibility at this point will help to move the project forward. I may be going to Washington, D.C., sometime in late May or early June, to show the documentary to a select group of veteran and disability leaders. Their reactions to the movie, and my Q-and-A period with them, could be important in securing those elusive national organizations to come on board. I am eager to hear what they will have to say, and I am feeling totally committed to doing whatever I can to turn the movie into a major movement. It’s completely possible that our documentary film, and our continuing efforts, may be a catalyst to help reduce veteran suicides, and at the same time help to improve the lives of all people with disabilities. Let’s see what the future has in store for the Why Can’t We Serve documentary. Thanks again for all your support, as our community of donors and friends continue to grow. And your interest in, and desire to help us with the movement, really makes a big difference! Welcome to the ninth newsletter, which is my way of keeping all of you informed of the progress I am making, now on the road toward recognition and distribution for the film. As of the end of February, I can share with all of you some exciting and positive results since the last newsletter. But I also have had some challenges and bumps along the way. Sounds like life, doesn’t it? Let’s start with the good stuff first. On January 27, I flew back to Kingston, New York, for a few days to be part of a wonderful dinner in honor of me and two other folks. The Kingston Veteran’s Association chose me to be one of the recipients because of the completion of the Why Can’t We Serve documentary film. The respect and appreciation for me was over the top, with all kinds of awards and commendations from the Veteran’s Association as well as from a few politicians who were present. The personal validations felt great, but I remain focused on the goal, which now is to get the film widely distributed throughout the country. I asked U.S. Rep. John Faso (R-Kinderhook), our local congressman, to help support the film by gathering a few Democrats along with a few other Republicans in Congress who would be willing to participate together in a promotional trailer to help get national recognition for the film. I told him I did not want any party to use the film as a political football. He heard me, and promised to get back to me about my request. As yet I have not heard back from him. Later that week, we were blessed to have Jay Ungar and Molly Mason come into the studio to finalize integrating their heartfelt music into the documentary. Working with them was fun and especially enjoyable for me, since I love watching and learning how highly skilled musicians reach beautiful results. Both Jay and Molly are well respected musicians and we are fortunate to have their music and their support. And their music adds so much to the whole movie. Thank you so much, Molly and Jay! During my time in Tallahassee, Florida, I showed the film twice. The first time was a private screening for the Tallahassee Council of the Blind. We had a sighted friend describe parts of the movie that had no dialogue, so all could follow. The folks in attendance seemed to really enjoy the film, and after, were filled with enthusiasm and creative ideas about what groups to show it to next. The TCB group has been very supportive to me and the project, and I felt very good about having a private screening for them. I promised them that I’d make sure the film would eventually have descriptive video as well as closed captioning, so all disabled people could follow the story. However, due to funding issues, we have not achieved that goal yet. The estimated cost for these additions is about $3,000. In the middle of January, Unity Eastside Church in Tallahassee had a screening of the movie also---the first public showing! Those in attendance were moved by the film, and had some important feedback and comments during the Q and A period. One woman said, “The movie was painful, but inspiring.” The next day I received a poignant email from another who saw the movie. Her comment is now on the home page of the Why Can’t We Serve website. Check it out. It’s worth it! Challenges - The project needs more funding and I am seeking a national organization to get behind the film to help with promotion and distribution. I have had a few very interesting contacts, and I would appreciate any connections that you may know of that can further this project, but at this time we have no contract or agreement. Sometimes you just have to persist and keep the faith that the perfect group is just around the corner (fingers crossed). I’ve been submitting the movie to just a few film festivals, but as of this writing we were rejected by only one film festival and have not heard back from the others. I am totally open to suggestions and leads to be able to move forward on this project. Please keep checking in at our website for future film festival information, as we will keep the website up-to-date with the latest. The Future - On March 15, there will be another screening of the movie at Unity of St. Petersburg in St. Pete, Florida. The minister and the congregation are friendly and supportive to viewing my film. Once again, I look forward to seeing what kind of response the film receives from people. If the movie is to have any momentum, it will be because of the reactions by those who see it. So far, those reactions have been very positive. Please help by going to the Why Can’t We Serve Facebook page and like us, and please share this newsletter with your Facebook friends. We need help getting the word out. If you’ve noticed, our subtitle has changed from “A Documentary in the Making” to “The Movie-Turned-Movement.” I think it’s a good change. But we are still working under a sense of urgency to help save lives. 22 Veterans are still finding ways to take their lives each and every day, and that’s just not acceptable. Thanks for supporting this project with your thoughts, your best wishes, and your financial assistance. You have already made such a difference! If you feel inclined to further your financial support, it would be greatly welcome! PS - If you or a friend wish to contribute to help us with the promotion, marketing, and distribution expenses of the Why Can’t We Serve documentary film, please go to the Contributions page. Welcome to our eighth newsletter, which is our way of keeping all of you informed of the progress we are making on the road to completing the documentary. Well, after two years of consistently working on the film, I now get to joyfully tell all of you dear friends and donors that our documentary has been completed. The movie is a little under fifty-four minutes, and I think the story holds up very well throughout the film. We are now in the post production phase, adding the music, which is so much more complicated than I ever imagined, and cleaning up a few minor pieces in the film. It’s very exciting, as we next need to do the audio mixing, finalize all the credits, and finally add the closed captions and the descriptive video so all people with disabilities can enjoy the movie to the fullest. At this point we are still needing to fund raise, now to secure funds to help us get the movie out all over the country. Currently, we are targeting some film festivals that we think will give us important visibility. Please check our website regularly to stay abreast of where we will be showing the film. I will be in Tallahassee, Florida, from December 26 through January 26, and my hope is to have at least two private showings as consciousness raising/fundraising evenings. I plan to send some promotional material out to groups in Tallahassee who might be interested in the film and about what we are attempting to accomplish. Although I am thrilled with how far we have come, I would like the movie to be seen widely and really make a difference. That’s the most important thing. Can our movie, in time, help reduce the number of Veteran suicides in our country? Only time will tell. The reason I am flying back to New York on January 26 is because the Kingston Veteran’s Association have chosen me, and two other Vets, to be honored at a special dinner. I am humbled by the recognition, but will happily do anything to get more visibility for the movie. Even come back to New York in January. I just hope that the weather gods are gentle with me. Bill Forte, the chairman of the Kingston Veterans Association, has been so incredibly important to this project. He has been at the forefront of continual support, helping to raise money as well as finding speaking opportunities on the radio and recognition on our local TV station. Thank you, Bill, for believing in this project, and in me. So now I’d like to ask all of you to think about a few things. I am searching for somebody who has the expertise to effectively help promote the Why Can’t We Serve film locally, regionally, and nationally. Please contact me if you know anybody who would like to be part of the team and the movement. There are so many directions we can go with promoting and marketing the film, and I have absolutely no idea which would be the best and the most efficient. We expect to hire for this position, however we cannot afford much at this time. But I have faith that, somewhere out there is the perfect person to help guide us to the next level with this project. If you have any radio or TV connections, I am open to being interviewed about the film. Also, please contact me if you have any connections with folks involved with film festivals. I want to wish all of you a happy and safe holiday season and a joyous New Year in 2018. The world is dynamic and constantly changing, and in spite of the challenges, it’s great to be alive and to do our best to make a difference! Thanks again for your support. PS - If you or a friend wish to contribute to help us with promotion, marketing and distribution expenses of the Why Can’t We Serve documentary film, please go to the Contributions page. CSN Songs performs a benefit concert on July 14 in Woodstock, NY, thrilling the crowd and raising awareness at the same time! Welcome to our seventh newsletter, which is our way of keeping all of you informed of the progress we are making on the road to completing the documentary. In our sixth newsletter we told you about a few fundraising successes as well as that I was in the semi-finals for the James Holman prize of $25,000. Well, unfortunately, I was not one of those chosen for the finals, so the hope of receiving the $25,000 first place prize went right out the window. I was stunned for a day, and a bit confounded by the fact that they could somehow choose ten other projects over such an important project like the Why Can’t We Serve documentary film. But I didn’t know anything about their selection process, and chose to not obsess about what I think was an oversight. I just decided to move on and continue to focus on completing the film. But it was disappointing! Some good news! In June, Mike, my cinematographer, went to North Carolina to secure some video clips of Tony Forte, already one of our most influential interviews in the film. Mike needed some action clips of Tony to add to some spots where he is talking. Now we have a blend of a few head shots of Tony as well as some footage of him functioning in his community. Mike also filmed Ivan Castro, a veteran of 28 years as an Army Special Forces soldier who lost his sight in a mortar attack on his unit in Iraq. It’s a fascinating interview because Ivan was able to remain active in the military for ten years after losing his vision. Obviously this interview proves that soldiers who come back from combat with disabilities, and are still high-functioning, are completely capable of continuing to serve honorably and effectively. More good news!! 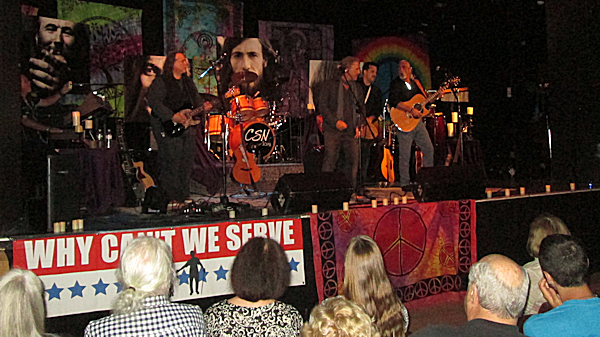 On July 14, we joined with Family of Woodstock, a not-for-profit crisis intervention center, to bring CSN Songs, a Crosby, Stills, Nash and Young tribute band, to town for a benefit concert. Over 200 folks in attendance had a great time dancing and singing those famous songs that were so influential. Between sets we showed the last five minutes of the documentary, along with a song I wrote to back up the visuals on the screen. The song is called "A Veteran’s Anthem." The combination of the song along with the visuals is inspiring and very hopeful, and a great way to end the movie. The concert was a wonderful success in every way except for fundraising. After all expenses, we came out with just a small profit. But the goodwill and the recognition the documentary got was priceless, and we are left with big smiles from the effects of the concert, as well as the reality that we will need to continue to create more fundraising opportunities before we will be able to complete the film. On July 26, we showed the first 12 minutes of the film along with the last five minutes to a group of 20 interested folks in Woodstock. Along with good, stimulating conversation about the challenge of reducing the number of Veteran suicides, we had a couple of people spontaneously express their disgust for the military, and for big business, which, according to one person, was at the root of the problem in our society. This was, let’s just say, a challenging moment for me. But I handled things pretty well, I think, and now have a better understanding of how to deal with similar situations that may arise in the future. What a good lesson! Every day there is a chance to learn something new. The near future: Right now we have enough material and enough funding to quietly work on a few more sections of the movie. The team of Mike Nelson, cinematographer; Charlotte Tusch, assistant director; Mark Ward, associate producer; Melissa Eppard, research director; and myself continue to work well together. I am hopeful that we can be completing the film by December, but to do this we will still need more financial support. We are looking at a few grant opportunities, as well as possibly creating a Kickstarter fundraising event. I would greatly appreciate some needed funding to quietly come from a few passionate supporters of the project, because grant writing and Kickstarter events take a lot of time and energy. I’d prefer just working on the documentary with no distractions. However, whatever happens with regard to fund raising, I intend to complete the film before the year’s end. Thanks for being part of our growing team, whether you have helped us with donations, come to our fundraising events, forwarded our newsletters to others, followed our newsletters and Facebook posts, or have just been wishing us well. Your cheering for us makes a big difference. I greatly appreciate your support. Wishing you all a fun and enriching second half of summer! PS---If you or a friend wish to contribute to the completion of the Why Can’t We Serve documentary, please go to the Contributions page. Welcome to our sixth newsletter, which is our way of keeping all of you informed of the progress we are making on the road to completing the documentary. In our last newsletter we told you that our funds were nearly gone, and that we would need to do some fundraising before we could continue our work on the film. Thank you to those of you who responded with personal donations through our website, whycantweserve.com. Well, when I went to Tallahassee, Florida, I had two wonderful fundraising experiences. After discussing the film project with the minister of Unity Eastside Church, which I attend when I am in the Tallahassee area, Reverend Jean DeBarbieris Owen, the minister, asked me to show the first 11 minutes of the film smack dab in the middle of their Sunday service. I was initially stunned by her request, but went along willingly. When Sunday came, I was introduced, got up and spoke a little about the project, then sat back as all in attendance watched the 11-minute clip. After the film, the minister led the congregation in a beautiful meditation, encouraging all to open their arms and hearts to veterans all over our country. We were literally blessed with this visibility and ended up raising over three thousand dollars that Sunday. Two weeks later, I spoke at the Tallahassee Council of the Blind monthly meeting, and once again was amazed at the enthusiasm and support for the project. The 20 blind and visually impaired people at the meeting voted to donate another $500 to the documentary. This was very special for me, to have a group of my peers continuing to show that kind of support. On Saturday, April 1, we showed the 11-minute film clip to 130 people, an overflow crowd for a benefit dinner in Kingston, New York, hosted and organized by the Kingston Veteran’s Association in tandem with the Centerville Boy’ Scout Troop 31. On a personal note, I want to thank Bill Forte, the chairman of the KVA, for his commitment toward making the evening a big success. During the evening I received many appreciations for taking on the issue of attempting to help reduce the number of veteran suicides in our country with the film. I was thanked by veterans as well as parents and spouses of vets and currently active servicemen. The benefit raised a total of $2,500 for the film. So now we have enough funds to pick up doing interviews again and slowly and methodically putting together more high-quality segments of the documentary. On another exciting note, I am now in the semifinals of the James Holman Prize competition, and will find out by the end of May if I will make it to the finals. The James Holman award is given to a blind person who is ambitiously creating some meaningful work that shows to all the world the excellent qualities and capabilities of people who happen to be blind. The first prize is $25,000, and if I happen to be so fortunate as to win, then we will be guaranteed enough funds to complete the project. It’s very exciting! We are still working on securing a band and a venue for a fundraising concert in July. Once contracts are signed, then we will send out a special notice about this upcoming event. Challenges: We continue to seek a celebrity to support our project as well as a national organization to help us with more visibility and credibility. I am still optimistic, but we could use some help in finding both. Each one of you who reads this newsletter may have a connection that could make the difference in us securing these needed additions. Please pray for our project, but make a few calls as well, if you may know somebody who knows somebody... Any effort you make will be appreciated greatly, whether successful or not. I want to thank you, in advance, for making the attempt. My frustration with reaching out in vain to senators has taken a creative turn. I have now decided to work toward completing the film first, and then send copies of the documentary to a few senators. Once they see the completed version, they may feel more inclined to be involved in the film. When we send them the final version, we will also let them know that we can fit in one or two minutes of them if they would like to align with the project. Let’s be patient and see how this strategy works. The immediate future: We have three important interviews lined up in the next couple of months. Once we film the interviews we will be done with the interview process. Between now and then we will continue to clean up specific segments of the documentary and hopefully piece them together in a way that keeps viewers engaged throughout the movie. We will be seeking the best quality for the film, but we will never forget our main focus. This documentary is a Disability Liberation issue that has a chance of shifting our culture’s perception of disability, as well as helping to reduce the number of veteran suicides across the nation. Those are our goals. Thanks for being part of our growing team, whether you have helped us with donations, come to our fundraising events, forwarded our newsletters to others, followed our newsletters and Facebook posts, or have just been wishing us well. Your positive energy makes a big difference. I greatly appreciate your support. Welcome to our 5th newsletter. The world is constantly changing, as we are, and everything is a little different today, then just a few months ago, when we last sent out the latest newsletter about the Why Can't We Serve documentary. I'm excited to let you know what has transpired during this time, and have lots of new information to share with you. I'll begin by letting you know that on December 27 we had a private viewing of a rough cut of the documentary. We invited about twenty close friends and supporters to see the first hour-long version of the doc. As expected and desired, we received priceless feedback about what was great, what was good, and what did not work so well. We also received incredible creative suggestions to help us with improving the flow and potency of the documentary. I am eager to implement many of the suggestions. The documentary has been called by some, not just a film, but a movement, to honor the debt that we owe to our wounded and disabled soldiers who have paid dearly in service to our country. I believe we, as a nation, need to face this issue honestly and make the necessary changes, before we can speak with integrity, and say that we stand by our troops and veterans. This film, when it comes out, will help bring to light this issue. My commitment to this project is stronger than ever. My cinematographer, Mike Nelson, and I worked long hours to have a rough cut ready for viewing by the end of December as we had hoped. In this we were successful. Unfortunately though, my optimistic calculations about when we would be ready to submit the film to film festivals will not be met. I had hoped in April or May we'd be ready for public showings, but that is not going to happen. There is too much work in front of us in order to meet that deadline. Our desire is to put together the best film we can, and I'd rather back up our plans for public viewing than present a film that I am not totally proud of. In addition, we have exhausted our finances and we will need to do more fund-raising to get what we need in order to complete the film without cutting corners. Many have told me that this is the normal process for making documentaries. Honestly, it never feels comfortable to ask for financial support, but I will do whatever I must to move this project toward completion and I count on your continued support to do this. I'd like to thank all of you in advance for any support you wish to offer to further this project. When donating to the project please go to whycantweserve.com where we are set up with PayPal. I plan to do some fund-raising in Tallahassee, Florida, in early March, and we have a wonderful fund-raiser set for April 1 in Kingston, New York, hosted by the Kingston Boy Scouts. We are also working on a benefit concert in the Woodstock, NY, area sometime in the spring. And if we find it necessary, we will do a public fund-raising campaign. A number of film experts have pointed out that the documentary needs to have one or two more potent interviews to help the film make a profound statement. The interviews need to be possibly of a disgruntled disable veteran, or of a spouse or parent of a vet who unfortunately committed suicide. Both would be ideal. Please help us find those interviews. We'd like the disabled veteran to be under the age of forty because we need this film to reach the younger generation as well as those vets and families who were affected in prior years. If you have any ideas, please contact me through the website or by phone at (845) 679-7532. Our attempts to find a celebrity to help us with visibility and fund-raising have not succeeded as yet, either. However, we did find a wonderful narrator with an excellent voice for the film. We remain hopeful that a celebrity will appear as an angel to help us. Please reach out if you know anybody who might enjoy supporting this kind of project, and whose presence will add strength and credibility to this documentary. Our efforts to interview Senators Schumer and Gilibrand did not prove fruitful. We now are planning to reach out to Senator Bernie Sanders and congresswoman Tammy Duckworth. Both have been supportive to veterans and may be open to helping. These extra interviews are not crucial, but would bring us more credibility with the public. We are doing our best to reach these folks. Perhaps you may be connected politically and can encourage support from political leaders to help further this project. Finally, I would like you to know that I've been going into the recording studio with a few wonderful local musicians. I'm singing the lead on the song, “A Veteran's Anthem,” which I wrote for the documentary, and it's almost completed. It will be heard at the end of the doc when credits are being shown, along with athletes with disabilities doing some very cool extreme sports as background visuals. I've been blessed to have Amy Fradon, Jim Barbaro, Cathie Malach, and Eric Parker supporting me with their musical prowess. This has also been lots of fun and another eye-opening experience for me. Those who have heard the recording seem to think that it will be a very useful motivational song for veterans. Signing off for now and wishing all of you a blessed year. 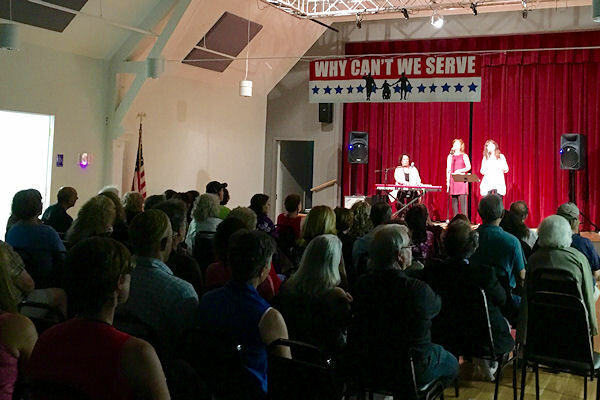 It was a packed house at the Woodstock Community Center on July 16 for the benefit concert in support of the Why Can't We Serve documentary project. A silent auction was also held at the event. This is our third newsletter to keep you informed about the latest progress in the making of the Why Can’t We Serve documentary. As of July 25, 2016, we are moving to another level as we've begun public showings of our new six-minute trailer. The trailer consists of clips of interviews we did with three inspiring veterans. Please click on the link and watch the trailer if you haven’t already seen it. Watch the trailer. The Why Can’t We Serve team organized a very successful benefit concert which took place on Saturday, July 16, in Woodstock NY. The good vibes from the evening were over the top! The music was great and the community came through, helping with setup and breaking things down at the end of the concert. Our fund raising efforts, however, fell short of our wishes for the event, but the ripple effect of the positive energy generated has been wonderful and continues to bring in contributions. Next Steps. We have tentative plans to interview Congressman Chris Gibson in August and we are planning to secure a few interviews with other congressmen and senators, possibly with a trip to Washington, D.C. When taking on a creative endeavor we must be flexible enough to flow with where the creative energy takes us. This is somewhat challenging to me because it means that my initial vision must change, and hopefully for the better. The change we are making now has to do with the understanding that we cannot cover, in depth, all of what I had hoped for in this documentary. So, instead of focusing on all people with disabilities, we are now going to focus specifically on soldiers who are wounded in combat and other disabled veterans. If our film helps the military shift its policy toward inclusion of disabled soldiers, then all people with disabilities will eventually reap the rewards from this positive change. However, I still plan to make it clear in the documentary that all people with disabilities have the ability and enthusiasm to participate responsibly in the military in noncombat jobs. Needs. We are still seeking one or two celebrities to visibly support the project as well as one or two national organizations to endorse us. I have no doubt they will appear, but sooner would be better than later. The celebrities will help us raise the funds we need to complete the documentary. The organizations will give us national visibility and credibility. Any help toward securing these would be greatly appreciated. Please forward this newsletter to anybody whom you think would be interested. Donations are being accepted through Pay Pal on our website, www.whycantweserve.com. In closing this newsletter, I’d like to let all of you know how grateful I feel as I work toward the completion of this documentary. The work has moved my life forward in many wonderful ways. I am happy and focused on the task at hand. I have meaningful work that I strongly believe can and will make a difference in the lives of Veterans and all people with disabilities. It doesn’t get much better than that! First of all, I want you to know that I have a wonderful and hard working person to be the associate producer of the documentary. Her name is Rosary Solimento, and she brings to the team a knowledge of film, an artistic eye, and an enthusiasm for the project. She’s a great addition and I’m very happy to have her support and expertise. Last week, I had an important meeting with U.S. Rep. Chris Gibson, congressman for the 19th district in New York. I initially contacted his office in November and, after being put off a number of times, finally met with him. Perseverance is important in the pursuit of any dream. The meeting started off slowly, but ended on a very positive note. Congressman Gibson, a veteran of 29 years, agreed to be interviewed for the documentary. He also agreed to pass on information about the planned Why Can’t We Serve documentary to U.S. senators Kirsten Gillibrand and Charles Schumer from New York. I’d love the opportunity to interview them. In addition, Congressman Gibson gave me a few leads to wounded soldiers still serving in the military. They could turn out to be very important interviews. Every soldier who has been wounded in combat, and who is still in the military and serving responsibly, is clear proof that there should be a broad policy to allow wounded soldiers with disabilities to have the chance at careers in noncombat roles. At this time, there is no policy. Permission is only given to a few select wounded soldiers to remain in the military on a case-by-case basis. Not all has gone as planned. We had a couple of temporary setbacks. Setbacks give us the opportunity to reset and move forward and continue our pursuit. I initially thought I would get the chance to speak at the National Federation of the Blind’s annual convention in Orlando, Florida, this coming July. But, at this point, that is very much in doubt. It’s still possible, but a few things have to fall into place to bring that to fruition. Also our search to interview loved ones of a veteran who committed suicide has not happened at the time of this writing. This, if secured, will be an important interview for the doc, but clearly is a very sensitive subject. However, I have been informed that there are people who would like the chance to share their story, especially if it helps prevent suicides of vets in the future. So, please contact me if you know of anybody who might want to help with such a moving story. The Why Can’t We Serve team just hired another filmmaker to work with us in the New York area. I am excited to work with Michael Nelson because he understands the issue of disability liberation as well as being a very creative and excellent filmmaker. We are working on the plans for two benefit concerts, one in July and one in October, to help with the growing expenses and offer some wonderful entertainment and a silent auction loaded with items for every taste. The plan is to have a three-minute trailer for the documentary to show at one or both of the concerts. I will send out more information about the concerts in our next newsletter. This project is alive because of your support through donations and encouragement. Your donations and enthusiasm make this project possible. Your best wishes mean so much for our continued success. Please pass this on to others who may be interested in following our progress, or donating to this project. Check out www.whycantweserve.com to donate, as well as to stay informed of the latest. 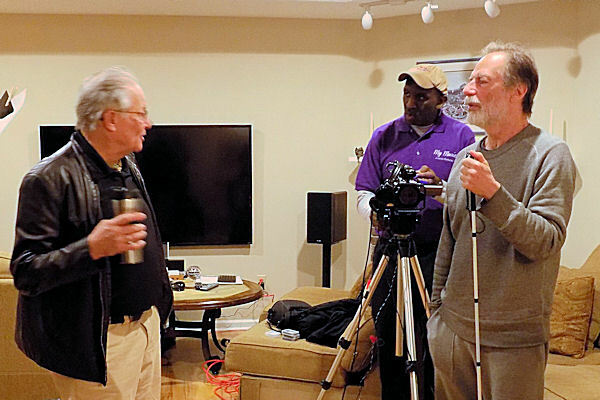 Former Leon County (FL) commissioner Cliff Thael, left, chats with Marty Klein, right, and videographer Kenneth Jones of Jvision Pictures during the documentary's first interview taping in Tallahassee, FL, on Feb. 20, 2016. First of all, I want to thank all of you for understanding the importance of this project, and being willing to contribute financially to the making of the documentary. Our fund raising efforts will continue, through the www.whycantweserve.com web site, since the costs involved with filming and editing are bound to mount up as we move forward. However, thanks to all of you, I am delighted to tell you that I have been making good connections here in Tallahassee, and that we have successfully completed our first day of filming. Here are some of the details. During my stay in Tallahassee I had two meaningful conversations, one with a retired Marine Corps general and one with the director of the Student Veterans Center at Florida State University. After hearing my intentions for the project, they both were supportive, and offered me valuable information for me to pursue. I also had a phone conversation with a retired Air Force lawyer in the Orlando area, who I plan to interview for the documentary in the near future. Each time I talk about my plans to someone, it appears that another door opens. It’s very rewarding to me personally, and affirming to the project. I presented at the Tallahassee Council of the Blind two weeks ago, and was delighted and humbled when they voted to support the project with a very nice donation. In addition, they were interested and encouraging, offering me a number of good ideas to pursue. I am working toward getting a chance to speak about the documentary project at the Florida council's annual state convention. This past Saturday we filmed interviews with five unique individuals, who all are wishing success for the project. They are a retired, but still very active, Leon County commissioner, a well respected nutritionist, a physical therapist, and two visually impaired men who work at the Florida Division of Blind Services. The interviews came out beautifully, although there now will be much scrutinizing and editing to find the most crucial points to share in the documentary from each interview. I will be sending out, from time to time, updates about the project, to keep all of you informed about the latest. These newsletters will subsequently be added to a special page on our web site for all to read. I will be back in Woodstock, New York, in early April and plan to set up more interviews for the doc, along with a number of speaking engagements. Please keep me and this project in mind, if you come across an organization or group that could help in any way.